Attractive large antique mahogany drop flap dining table. A lovely mahogany dining table. We date this table to the early 20th century. The table sits on queen anne cabriole legs and is oval in shape when fully opened. The table will sit 8 comfortably and will accommodate 10 when required. The main oblong table top has two drop flaps along its longer edges. The drop flaps are supported by an extra leg that swings out on each side. The table has a height of 29.5" (75cm), an un-extended width of 24.5" (62cm) and a length of 67.5" (172cm). With the drop flaps raised the width increases to 73" (185cm). This lovely mahogany dining table remains in very good solid condition with only very minor surface markings commensurate with age and usage. There are a couple of light usage marks, indentations and light scratches to the main table surface from past use. The finish has mellowed slightly over time and there is a slightly darker mark to the very centre where something has sat in the past. The very bottom of the legs has had small circular extentions added at some point in the past to give the table a small lift. 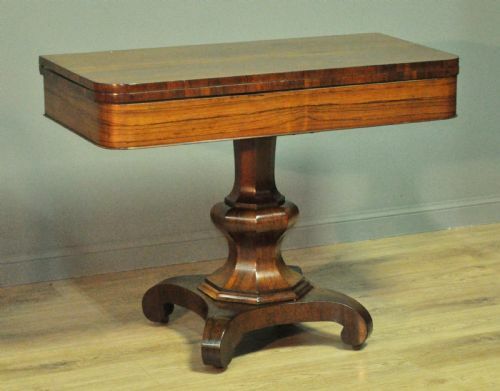 This remains a very stylish and elegant mahogany table. It will continue to provide good service for many years to come. Attractive antique Victorian rosewood fold over tea table. A lovely antique Victorian rosewood tea table. We date this table to the mid 19th century. The table sits on an octagonal baluster shaped support on a shaped base with scroll feet. The main table top has a double thickness. These are able to be twisted then folded over to allow the table to be used at full size. There is a small storage section below the playing surface for cards, counters etc.. The table has an open height of 30" (76cm) with an open width and depth of 40" (102cm). With the leaves closed the table is 30.5" (78cm) high by 40" (102cm) wide by 20" (51cm) deep. This lovely tea table remains in very good solid condition with only very minor surface markings commensurate with age and usage, including some very minor marks and light scratches to the top surface. There is a tiny piece of veneer missing from the back edge of the table. This remains a very stylish and elegant tea table. It will continue to provide good service for many years to come. Attractive antique Victorian inlaid mahogany fold over tea table. A lovely antique Victorian tea table. We date this table to the mid 19th century. The table sits on four downward tapered legs with brass castors. The main table top has a double thickness. The rear legs of the table are able to be swung out to support the top when folded over. There is a drawer to the front plinth of the table, the drawer is fitted with a pair of ornate brass drop handles mounted on embossed backplates. These are not original but period replacements. The table has an amount of inlay including a line of herringbone inlay to the top surfaces and a foliate and vase inlay to the top of the front legs. The table has an open height of 29" (74cm) with an open width of 42.5" (108cm) and a depth of 38" (97cm). With the leaves closed the table is 30" (76cm) high by 42.5" (108cm) wide by 19" (48cm) deep. 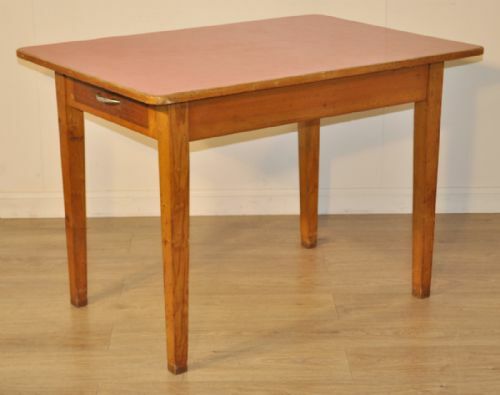 This lovely tea table remains in a good solid condition with only very minor surface markings commensurate with age and usage, including some minor marks, indents and light scratches to the top surface. There are some small pieces of veneer missing from some edges and the table finish has mellowed over time. 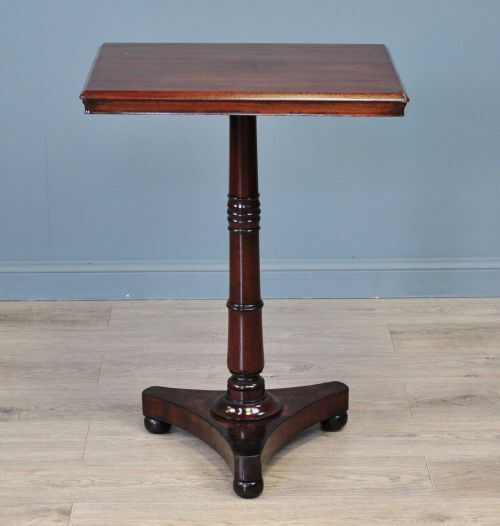 Attractive small antique Victorian mahogany occasional table. A lovely antique mahogany occasional table. We date this table to the mid 19th century. The table sits on a tripod base with small bun feet. The table has an attractive turned column. The top surface of the table has a decorative stepped edge. The table has a height of 30" (76cm), a width of 22" (56cm) and a depth of 18" (46cm). 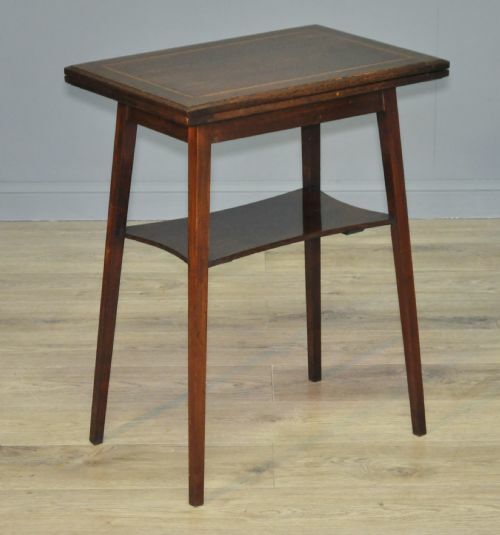 This lovely occasional table remains in very good solid condition with minor surface markings commensurate with age and usage, including a few very light surface marks and a small scratch to the top surface. There are some old repairs to the veneers on the base edges and the top edge of the table has a bit of wear. 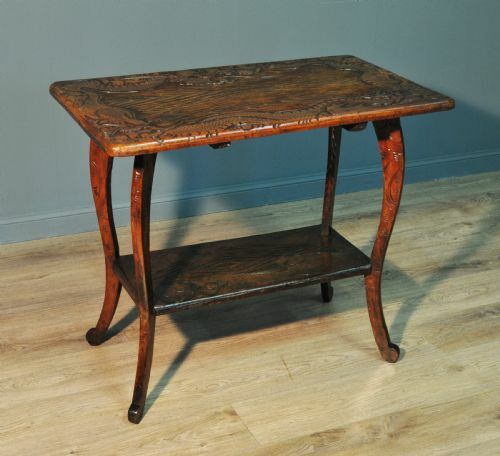 This remains a very stylish and elegant antique occasional table. It will continue to provide good service for many years to come. 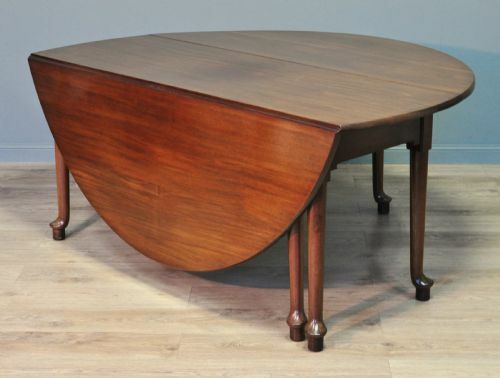 Attractive antique Edwardian walnut turn over card hall table. 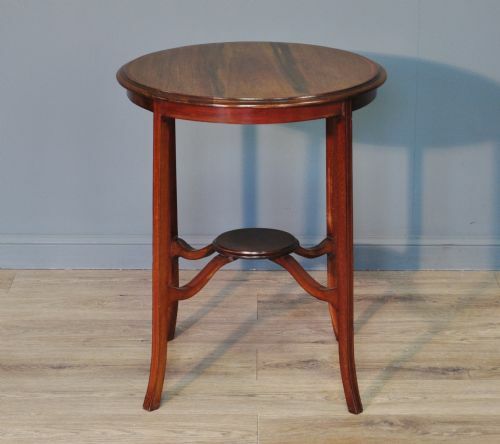 A lovely antique Edwardian walnut card hall table. We date this table to the very early 20th century. The table sits on four downward tapered turned legs with an h stretcher for support. The stretcher has small turned columns for decoration. The main table top has a double thickness. These are able to be twisted then folded over to allow the baize covered playing area to be shown. The table has an open height of 29" (74cm) with an open width and depth of 35" (90cm). With the leaves closed the table is 29.5" (75cm) high by 35.5" (90cm) wide by 18" (46cm) deep. 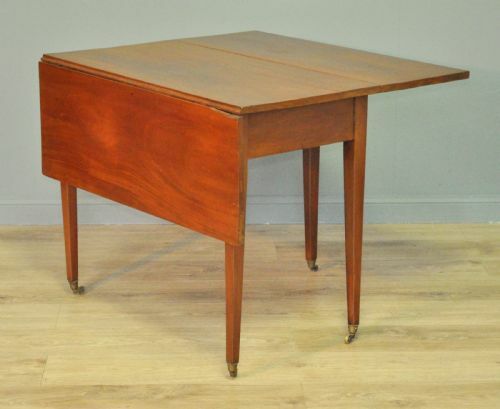 This lovely card table remains in very good solid condition with only very minor surface markings commensurate with age and usage, including some very minor marks to the top surface. The green baize is showing a bit of wear primarily to the centre line where it has mellowed and started to split at one end, the playing surface is in a very usable condition as is. This remains a very stylish and elegant card table. It will continue to provide good service for many years to come. 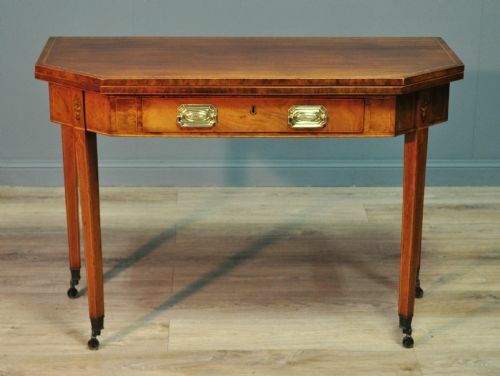 Attractive small antique Edwardian inlaid mahogany turn over card hall table. A lovely small antique Edwardian inlaid mahogany card hall table. We date this table to the very early 20th century. The table sits on four slender downward tapered legs with a central supporting shelf. The main table top has a double thickness. The top section is formed from two oblong shaped sections. These are able to be twisted then folded over to allow the baize covered playing area to be shown. The table has an open height of 27.5" (70cm) with an open width of 30" (76cm) and a depth of 22" (56cm). With the leaves closed the table is 28" (71cm) high by 22" (56cm) wide by 15" (38cm) deep. 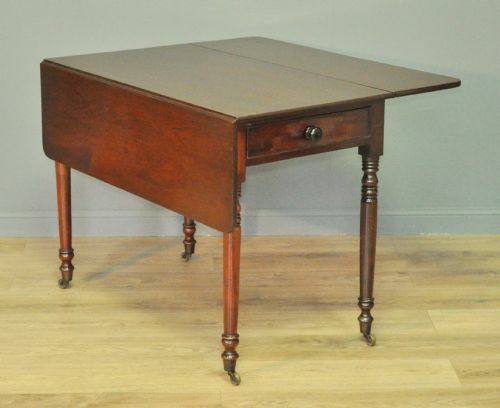 This lovely card table remains in very good solid condition with only very minor surface markings commensurate with age and usage, including some very minor marks to the top surface. The green baize has some lighter marks from past use. 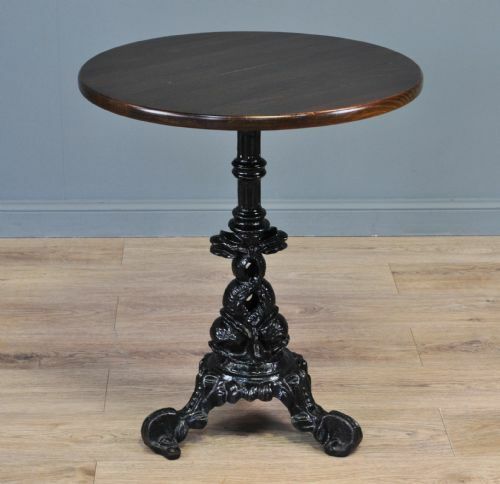 Attractive antique Victorian cast iron pub/garden occasional table. 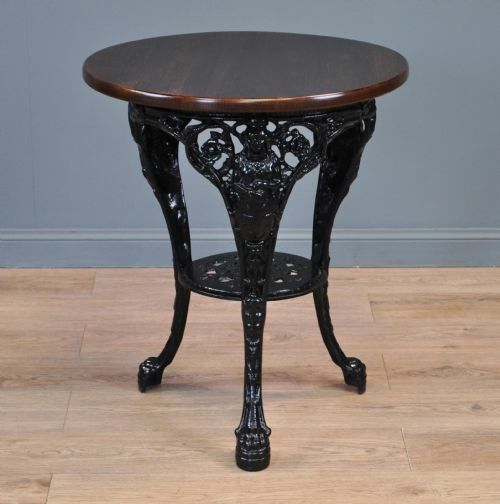 A lovely Victorian cast iron table. We date this table to the later part of the 19th century. The wooden top surface has been added at a later date and is likely to have been used in a pub. The table has a two tier design and features Britannia style ladies holding a shield with the Union Jack. The table has a height of 28" (71cm) with a diameter of 24" (61cm). 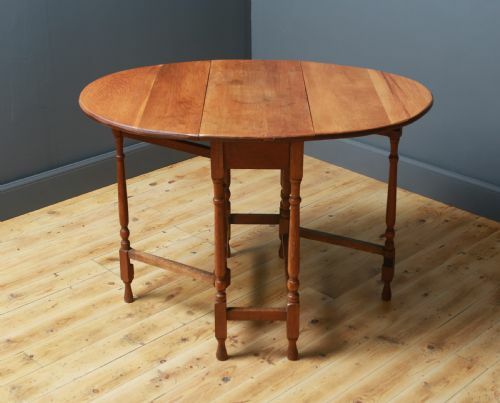 This lovely Victorian table remains in very good solid condition with minor surface markings commensurate with age and usage. The top surface has a few minor marks and indentations from past use. 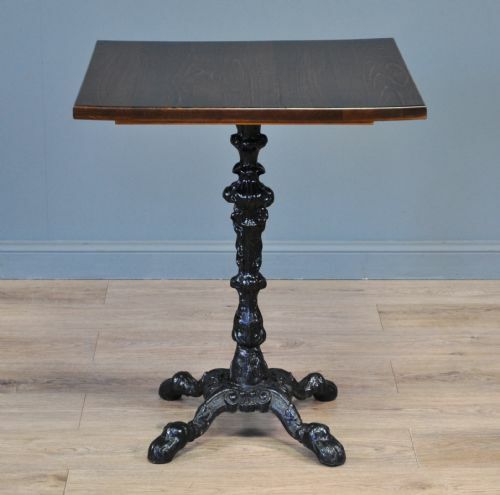 This remains a very stylish and elegant antique Victorian table. It will continue to provide good service for many years to come. Attractive antique pine coffee table. A lovely antique pine coffee table. We date this table to the late 19th century. The main table top is rectangular in shape with rounded edges, the top sits above a heavy painted base. There is a single drawer to the edge of one side. The plank top sits on top of the base and can be removed for transport. The table has a height of 20.5" (52cm), with a length of 51" (130cm) and a depth of 35.5" (90cm). This lovely coffee table remains in good solid condition with only very minor surface markings commensurate with age and usage. The top surface has a few light indents, scratches and marks from past use and there is a bit of wear to one corner of the top surface. There is an area of wear to the paint on the stretcher. This remains a very stylish and elegant coffee table. It will continue to provide good service for many years to come. Attractive vintage oriental dragon carved hardwood hall/side table. A lovely vintage carved oriental table. We date this table to the first half of the 20th century. The table sits on four slender cabriole legs and has a decorative two tier design. The main table top has been ornately carved with a dragon's body running around the outer frame. The table has an overall height of 30" (76cm), a width of 35.5" (90cm) and a depth of 20.5" (52cm). 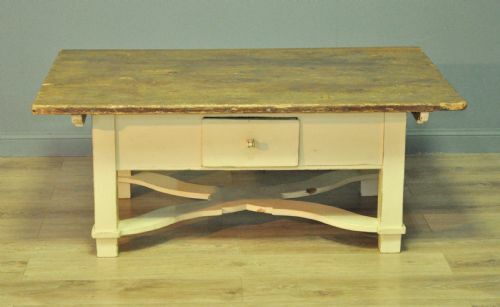 This lovely vintage table remains in very good solid condition with only very minor surface markings commensurate with age and usage. The table top has some minor indentations and light scratches from past use and the frame has a small amount of play. This remains a very stylish and elegant vintage table. It will continue to provide good service for many years to come. The table has a tripod base with ornate sea serpent decoration. The table has a height of 27.5" (70cm) with a diameter of 24" (61cm). The table has a four legged base with ornate decoration. The table has a height of 28.5" (72cm) with a width and depth of 24" (61cm). Attractive vintage rustic oak work table. A lovely vintage oak work table. We date this table to the mid 20th century. The table sits on four long, sturdy, slender, downward tapered, square section legs. The main table is fitted with a drawer at either end. The drawers are fitted with stand out metal handles. The top surface has a red formica insert. The table has a height of 30" (77cm), a width of 43" (110cm) and a depth of 31" (79cm). 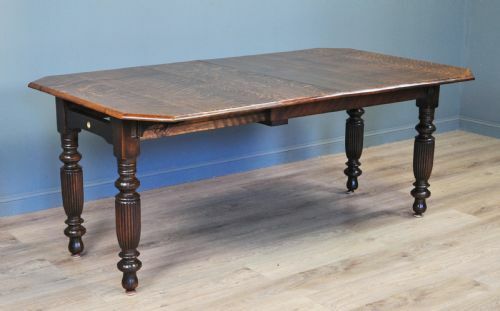 This lovely vintage rustic oak table remains in a good solid condition with only minor surface markings commensurate with age and usage, primarily to the bottom of the legs an the edge of the top surface. There are also some faint ring marks to the top surface. Attractive small antique Edwardian inlaid mahogany 2-tier occasional table. A lovely inlaid mahogany occasional table. We date this table to the very early 20th century. The table sits on four downward tapered splayed legs. The legs are joined by a bottom tier shelf. The top surface of the table has a decorative stepped edge and features a band of inlay. The table has a height of 28.5" (73cm), a width of 23" (59cm) and a depth of 23" (59cm). 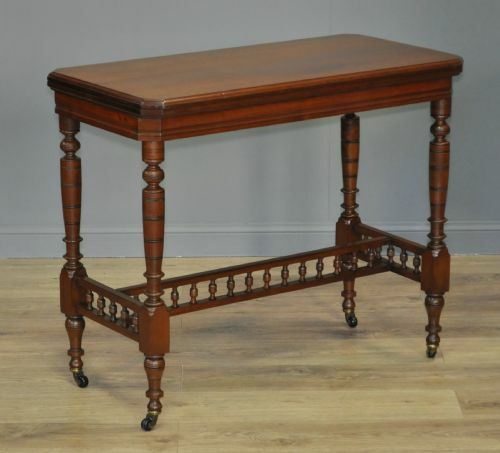 This lovely occasional table remains in very good solid condition with minor surface markings commensurate with age and usage, including a few very light surface marks and a small scratch to the top surface. Attractive small oak turned gate leg drop leaf side table. A lovely oak gate leg dining table. We date this table to the early 20th century. The main table consists of a small centre table with two drop leaves either side. The table has an oval shape when opened. The drop leaves are supported on gate leg frames which are constructed from turned legs braced with oblong section cross rails. The main table has a height of 29" (74cm), a length of 13.5" (34cm) and a width of 30.5" (78cm). With the drop leaves raised the length increases to 42" (107cm). This lovely small vintage oak drop leaf dining table remains in very good solid condition with only very minor surface markings commensurate with age and usage. There is some light surface and finish marks to the table top which includes some minor scratches, ring marks and indentations from past use. It has been refinished at some point in the past and there are a few old repairs. There is a bit of wear to two legs at the bottom. This remains a very stylish and elegant oak gate table. It can be easily stored in a small space when not required. It will continue to provide good service for many years to come.